The OS is Windows XP and the program is Microsoft Office Standard 2007 (Excel). This computer recently upgraded from Office 2003 to Office 2007 (Yeah, I know don't shoot me). 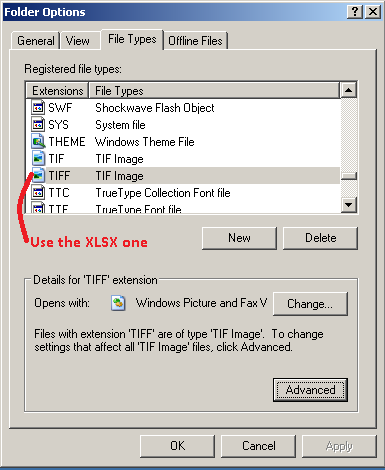 Upon clicking any .xls or .xlsx file Excel 2007 will open and stop there. The file itself will not open traditionally. The workaround thus far is to then go into the menu and select Open and select the file that way, then the file opens. Microsoft Word does not have this same issue; the files open correctly. The .xls and .xlsx files are already associated with Microsoft Excel 2007. Any help is appreciated. Go to http://support.microsoft.com/kb/211494 and it will give a very clear explanation of how to make it so Excel opens the file. I searched on: "Excel 2007 'There was a problem sending the command to the program'" since that was the error message. Open the Excel application. Here are Microsoft's instructions from that link - very simple to follow! Click Advanced, and then click to clear the Ignore other applications that use Dynamic Data Exchange (DDE) check box in the General area. Click the Microsoft Office Button, and then click Excel Options. Click Options, on the Tools menu. Click to clear the Ignore other applications that use Dynamic Data Exchange (DDE) check box, and then click OK. 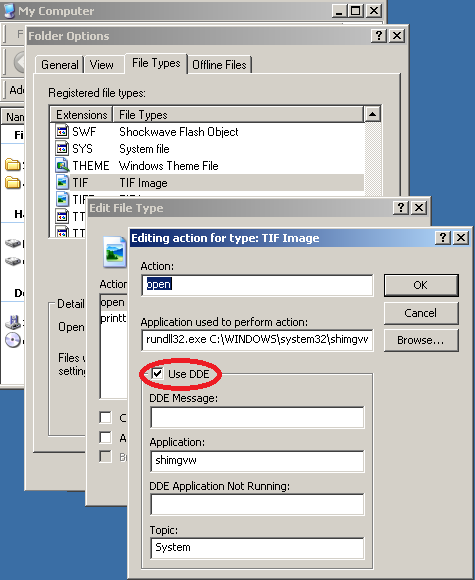 Even if the option Ignore other aplications that use Dynamic Data Exchange (DDE) is already clear (false), click to enable and then click to disable. After you do this, you should be able to open workbooks by double-clicking them in Windows Explorer. Using @Hennes direction I ended up opening a Windows Explorer Windows and navigating to Tools then Folder Options. Then in the new window I selected the File Types tab. At the end of the string there was a %1 which I changed to "%1". I repeated this process for the XLSX extension as well. After closing the window I was able to double click and immediately open any excel files without any issues. if you have ms office installed there will be several listen file extions here, e.g. `xslx'. (I got no access to computers with ms office atm. I am at home where I use open office. Hence more more precise screenshots). If you click on an extension it should show which program it opens with, an option to change the program and a tab advanced. If it is there and the problem is very recent, first check for the XDocCrypt.A/Dorifel virus (New since yesterday. Quite virulent and messing with both excel and word files). Sometimes you run into situation where the DDE option is marked but does not work. Not even after de-installing and reinstalling office. I am not sure what causes that problem, but I have worked around that in the past by defining my own action via [New], selecting excel as the program to open it (use browse) and adding "%1" behind the program. (If you do not add anything clicking on and .xlsx file will start Excel. it will not pass the file name and you will still look at an empty spreadsheet. Adding %1 will pass the file name. It will work as long as the file name does not contain space. Else double clicking on my test.xlsx will open excel and tell excel to try to open the file my. Which will fail. Adding "%d" should work, even for files with spaces in them. 1) I used to use that with office 2003, not 2007. It should work the same though. 2) I am mostly recalling stuff I did 2 years ago. I might have skipped a step. 3) Fully untested with 2007 and xslx, since I do not have access to office 2007 atm. Please let us know if it worked, or if I need to clarify some points. This took me something like 3-4 minutes. This solved it for me. Not the answer you're looking for? Browse other questions tagged windows-xp microsoft-excel-2007 or ask your own question. Is there any way to suppress the Excel 2007 warning “in a different format than specified by the file extension”? How do I change the default program to open Excel files with from Excel 2010 to Excel 2007? How do I change default excel extension in Excel 2007? How to prevent office 2007 from opening an *.xls file? How can I open .xls file with Excel 2016?